Even vitamins can be harmful if ingested, so everything should be kept under lock and key. When you fill prescriptions at the drug store, ask for child safe bottles for added security. Don’t rely on them however, because as your child gets older they will be able to figure the bottles out! 1. Always have the poison control number posted for easy reference. Most parents will have it by every phone and on the fridge as well. When panic strikes you may not be thinking clearly and you want to make the call as soon as possible. If you call your local poison center (which should be listed in the yellow pages) they may be able to provide you with stickers and magnets to put in your home. They should be similar to the graphic below. Whenever you leave your child with a babysitter or grandparent, make sure that they are aware of the number as well. When you do call the poison hotline, they will want to know certain information. This includes: child’s condition, age, weight, product ingested, time that the poisoning occurred, your name and phone number. The center will then give you instructions on what to do next. 3. Be prepared! The following should always be under lock and key, and only use them if instructed to by the poison control center. b. Activated charcoal- this will absorb the poison. Some officials think that it is less palatable for children, so discuss this with your health professional. 4. Don’t trust the package details. Many times they will be wrong. Also never make your child vomit unless directed by the poison control center. Certain products will actually do more harm when vomited. 5. Never treat an unconscious child- let the professionals handle it. 6. 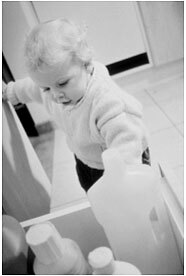 Begin to teach your child early the dangers of cleaning supplies and medications. Small children confuse medication with candy so it is important that you begin the education process early. Print out the following emergency action sheet for quick reference. It will tell you what to do in certain situations. Educate your children early on the dangers of poison. The following is a website that features kid-friendly graphics, coloring pages, and other helpful items.